The Rocky and Bullwinkle Show is the collective name for two separate animated television shows; “Rocky and His Friends” (1959 – 1961) and “The Bullwinkle Show” (1961 – 1964). Rocky & Bullwinkle are the primary characters in both shows. Most Rocky and Bullwinkle fans are aware that the hometown of Rocky and Bullwinkle is Frostbite Falls, Minnesota. What many fans don’t realize is that there was a real life connection between Minnesota and Jay Ward, the creator of Rocky and Bullwinkle. Jay Ward grew up in Berkeley, CA. As a child he listened to the radio because broadcast television was not yet available. Jay somehow located broadcasts of the University of Minnesota Golden Gopher football games and he (for reasons unknown) became a big fan of the Golden Gophers. He was especially drawn to their star football player, Bronko Nagurski, who played for the Golden Gophers from 1927 to 1929. Jay also heard weather forecasts for various parts of the country when listening to the radio. Every so often Bronko Nagurski’s hometown of International Falls, MN was mentioned in the weather broadcast as being “The Icebox of the Nation”. This apparently tickled Jay’s imagination, and in the early 1950’s, International Falls, Minnesota became the inspiration for “Frostbite Falls, Minnesota”, the hometown of Rocky and Bullwinkle in the “Rocky and His Friends” series first broadcast on national TV in late 1959. 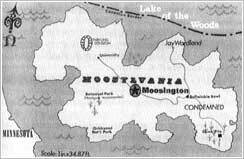 In the fall of 1962, Jay Ward decided to start a campaign to have Moosylvania accepted into U.S. statehood as the “52nd State” (not sure who the 51st state was/is). This was a publicity stunt to draw attention to his latest nationally syndicated cartoon known simply as “The Bullwinkle Show”. Jay Ward asked his film editor, Skip Craig (born in Detroit Lakes, MN), to travel to Minnesota to purchase land for Moosylvania. Jay wanted to find an island in northern Minnesota close to the Canadian border, and sent Skip off to Lake of the Woods county. Skip went to work to find an island to purchase, but no one was willing to sell their property. He ended up reaching an agreement with one of the island owners in Lake of the Woods county who was willing to lease their island for up to three years at a cost of $1500. With lease in hand, Jay and his publicist Howard Brandy began making plans for a cross-country tour to gather support (and signatures) for a petition asking for statehood for Moosylvania. The goal was to present the Moosylvania petition to President John F. Kennedy to try to prove that it had enough support to become the “52nd State” of the Union. It was a pretty elaborate campaign that made stops in 22 cities. The grand finale event was the “The Moose’s Day Parade”, which would proceed down 46th Street in New York City about a week before the Macy’s Thanksgiving Day Parade. Up until then, Jay and Howard would travel across the country in a Ford Econoline Van, elaborately painted like a vintage circus wagon. Jay wore a Napoleon-like costume, his partner Howard dressed up as a Canadian Mountie. They had much success along the way, with a final leg leading to Washington, DC. Unfortunately their timing couldn’t have been worse. Jay and Howard ended up arriving on the doorsteps of the White House in November 1962 at the very same time that the Cuban Missile Crisis had reached it’s boiling point. Federal authorities had very little interest in humor at this time, and turned them away. As a result, Jay and Howard were forced to cancel their dreams to gain Moosylvania Statehood, and made the long drive back to Hollywood, with stops along the way to promote “The Bullwinkle Show”. What a trip it must have been! The connection between Jay Ward and Minnesota doesn’t end with Frostbite Falls and Moosylvania though. The fact is that one of Jay’s primary clients was Minnesota-based General Mills. Throughout the years Jay’s cartoon characters would make a number of appearances in General Mills commercials for products like Cheerios, Cocoa Puffs, Jets, Trix and more. The simple truth is that both Jay Ward and Minnesota had very good ties throughout the years. You can find some additional info on Jay from an interview by Shirley Silvey (storyboard/layout/design artist at Ward’s) at http://www.toonarific.com and also from the great book by Darrell Van Citters “The Art of Jay Ward Productions”. Fun article. Thanks a lot. Small thing…Berkeley,CA is spelled with 3 e’s. I live across the bay in San Rafael. Thanks for the clarification. It has been updated to “Berkeley”. What is the name of that island or its exact location? It’d be nice to at least set up a plaque in Ward’s and Scott’s honor for their contribution to animation, humor, and unique sense of fun. That’s great! Do you have any additional stories about Jay Ward that you can share?